Cotton fabric is popular for comfort and convenience. The wearer feels relaxed during the summer season when the heat is on and it gets too humid. Cotton breathes when the body sweats to absorb the moisture & evaporates. from the surface of the fabric. It is not too harsh on the skin in contrast to a mixture of artificial materials that offer your body a rash. Summer Season's Extreme Heat Is Bearable with only Natural Cotton fabric. It is the only ultimate solution to fight against heat during the summer. It is the only against Heatwave of Countries like India, Pakistan, Bangladesh, Sri Lanka & Gulf. It is most convenient, comfortable, Lightweight, soft & smooth-feel due to its property. Especially Kurti Tunic (Shirt type Top) is a perfect fit for every age group’s woman. Wrinkles and vulnerable to contraction.It needs more care in washing. Dry-cleaning is better option to maintain its quality. Blending with other fibers and proper finishing helps to overcome both disadvantages. As soon the summer approaches, every modern woman dislikes wearing sarees and dresses. They prefer cool cotton tunics, which provide sweat free body throughout the day. The summer tunic comes with refined artwork, crisp material & bright colors. Traditional and straightforward cotton tops are best for daily wear. No one can deny the fact that Indian women love to wear Summer Kurti (cotton tops) compared to other ethnic wear. Cotton has become an essential part of Indian fashion because of the climate of the country. The Cotton top becomes a regular wear in summer. It is a best comforting and cooling in summers. Summer tunic tops are available in both readymade and unstitched format. One can have a range of linen tops depending on their comfort and choice. They can also get it stitched in different styles. Voile is a shining, lightweight, fabric that has a little amount of crisp. It is mainly used to make blouses, lingerie & nightgowns. Satin is a fabric made with the satin weave, which results in the cloth being lustrous with a smooth feel. It’s used to make bed sheets, dresses & household décor. The lawn is a thin and moderately sheer fabric having high thread count fibers. It has a variety of uses such as dresses, handkerchiefs & blouse. The lawn fabric was being produced out of linen yarn. Velvet is a closely woven fabric with a thick and swish pile that enhances the softness of the fabric. Some people believe that velvet is a separate fabric but it is a weaving style based on the theory of double cloth. Denim is a strong heavy twill cotton fabric. It is known as jeans and it is now the youth’s heartthrob. Nowadays it is blended with Lycra to give a more stretchable and comfortable fabric. It is a fabric with loops, which enables it to absorb large amounts of water. It is manufactured on weaving or knitting machines. Terry Towel is a fabric with long loops facilitates the absorption of large amounts of water. The fabric made of 100% cotton or it may contain a certain percentage of polyester yarn. It is made on the theory of double cloth in weaving. French Terry is generally used in clothing. It is either 100% cotton or contains polyester with Lycra. It is often warp knitted. It is one of the finest kinds of cloth. It is a lightweight plain-woven fabric. Initially, it was made of linen; later, the term came to be applied to cotton fabrics as well. Rich looking Girls Tunic Tops are produced from this fabric. It is generally of almost the same weight as cambric. The difference is the feel of the fabric. Its feel is coarser than cambric due to its weaving pattern. Cheap simple kurtis are being produced out of this type of cotton fabric. It is The Traditional fabric of India whose history can be found centuries back. It is 100% handmade with fiber to fabric using hand spinning & handlooms. It is woven all over India and Pakistan. It is popular as a fabric for politician’s attire in India. Nowadays it is also produced on semi-automatic looms. Semi-automatic looms fabric is nowhere near to the handmade. Woman prefers wearing Khadi kurti in the summer season for protection. It is much costlier than the other kinds of cotton fabric. It is expensive owing to the finest quality of Yarn used and it requires perfect weaving. It is an upgraded version of Khadi. Linen kurta kurti & Tunic Tops gives rich look to the wearer because of its texture along with feel and fall. In many parts of India, sarees and salwar are being designed with hand block print. Following the same method, Printed cotton kurti designs come with hand block print. These types of kurtis are very popular among today’s fashionables for its unique prints. The floral worked tops with embroidery patterns are in vogue. Trendy neck patterns also add class to the look of the wearer. Zari (Metallic Yarn with glittery effect) and Resham (Silk Thread) artworks also offer an exciting look. 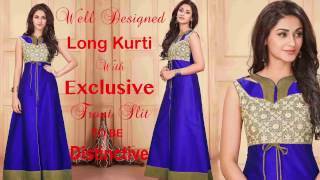 Designs of kurtis in a cotton material are straightforward to blend well to suit any vogue. No matter what changes take place in fashion industries, but the stylish kurtis will be popular and that’s for sure. Latest kurti designs in cotton are available in digital printing with a variety of styles. This type of printed kurti is 1st choice of college girls. The reason behind the 1st choice is, very easy to pair with various colored trousers, jeans or legging. Kurta is like kurti. Kurta is distinguishing with kurti by its different type of patterns. Normally Kurta consists long sleeves, collar and front buttons style with small side slit and length between knee and waist. It is most suitable to wear with fancy salwars or salwar type palazzo pants. Find our designer collection of Indian Cotton tunics tops with various neck patterns and new models with a different type of styles. Buy Casual, simple & western style tops of your choice and enjoy this summer with full of convenience and comfort. Nowadays various mix and match patterns are popular. Contrast and sober color combination and mixing add beauty to kurtis. Horizontal and vertical patterns are being developed to suit your body shape are available to choose from. Various shapes and cuts are also on latest trend. The fancy short kurtas in cotton are considered as best wear for college and workplace. Young generation (girls) is desperate to buy cheap & best latest cotton kurtis from online shopping stores of India for lowest price. Visit our entire web store www.designerandyou.com for cheap and best buying. 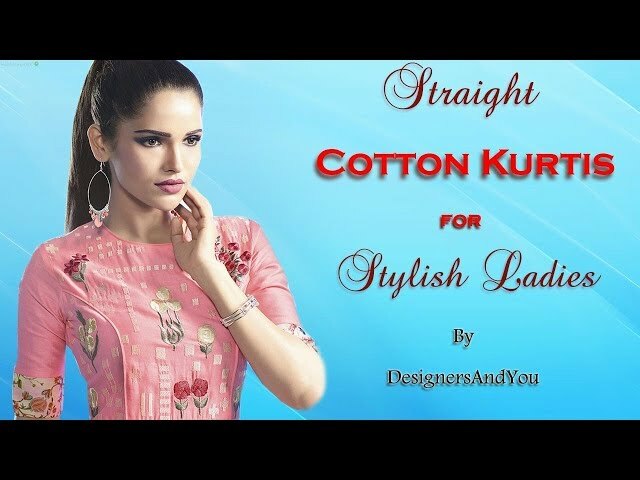 Ladies can go for designer/fancy, stylish/simple, short/long & plain/embroidered options in latest cotton kurti designs.